It finally happened. For years, Japan has been waiting for the latest Dragon Quest game, and yesterday, it launched. Anxious gamers lined up in droves to purchase the title. In Shibuya, there was a special countdown event at retailer Tsutaya for the game. 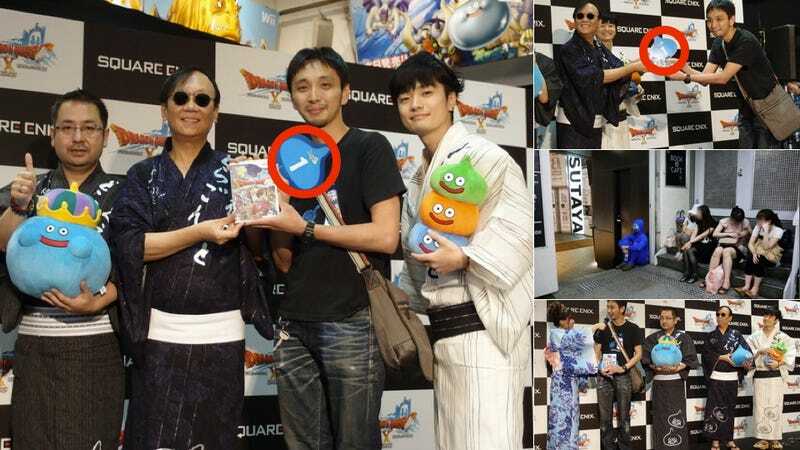 The first person in line appeared on stage and received his purchased copy directly from DQ creator Yuji Horii. What a wonderful way to get the game. But what if he wasn't really first? What if this whole special event was staged? Fake? These are the questions swirling around Japanese cyberspace. The first person in line was 33 year-old Kensuke Matayoshi. It was his face splashed all over the Japanese newspapers. It was Matayoshi who was interviewed on TV. According to the Japanese media's coverage of the event, Matayoshi, who was listed as a temp worker, waited in line for 24 hours for Dragon Quest X. It could be true that he does temp work. What the media didn't say was that Matayoshi is also a struggling actor. He's not famous by any means, and nobody in line knew he was an actor. His identity wasn't known until Japanese forums started digging around, pulling up his talent agency resume. So he's an actor? So what? Thing is, Matayoshi apparently didn't wait 24 hours for Dragon Quest X. Some are wondering if he wasn't a plant. And the countdown went off without a hitch. At 8:30pm, a staffer from Tsutaya in Shibuya appeared to determine who was first in line. Mr. Sato said he was, and the Tsutaya staffer disappeared. Thirty minutes or so passed. Then Matayoshi showed up, and the shop staff said he was first in line—not Sato. When Rocket News asked why Matayoshi was first, Tsutaya allegedly said that he had been in line at 7am, which was before the young women lined up (mind you, none of the women apparently saw Matayoshi before this). So Kensuke Matayoshi was shuffled to the front of the line. Everyone waited for the countdown, and then Matayoshi appeared on stage with Horii for the launch event. And the countdown went off without a hitch. In Japan, there is a long tradition of fake line standing. They're called "sakura" (偽客), which doesn't refer to "cherry blossoms" ("sakura" or 桜). Instead, the word literally means, "fake" (偽) "customer" (客). They're shills. In recent years, sakura have appeared on television or in lines. Heck, the first guy in line for Kinect in Japan listed his occupation as "sakura". Big companies do use "sakura" in Japan, and they do fess up when they get caught. For example, in 2008, McDonald's Japan even admitted it paid one thousand people to line up for Quarter Pounder burgers after sakura accusations. So much of Japanese TV often appears staged, and sakura can make things, such as product launches, appear successful and structured. Sometimes sakura can give mass media the quotes they need for the evening news—and companies don't have to worry about people saying the wrong thing. In Japan, there is a long tradition of fake line standing. That doesn't mean every launch even is stocked with fake shills. Sony's PS3 launch event in Tokyo seemed to be largely sakura free—and thus, it might now serve as a case study so micro-managing companies can know what not to do. The first person in line was a foreigner who didn't speak much Japanese and didn't even seem interested in video games. Many of the people waiting in line seemed to be homeless people who were allegedly paid to line stand. That was the reality of the launch. But reality is scary. It's something you cannot control. So sure, it's possible Matayoshi was there at Tsutaya in Shibuya at 7am. It's also highly possible that he's a huge DQ fan. But even if he did show up at 7am, isn't the point of line standing, well, line standing? It's a waiting game—you can't just have your first spot in line held for you while others wait, right? Mr. Sato thinks Tsutaya took one look at him—decked out in that blue Slime outfit—and thought he looked creepy or strange and decided to shuffle in the professional actor. Yes, Mr. Sato was doing a stunt for his website. And yes, Mr. Sato concedes that he looked creepy and strange, but he was first in line. First comes first, except with you're dressed like a blue Slime and there's a normal-looking dude only a phone call away. Kotaku reached out to Square Enix prior to publication and will update this story should the company comment.